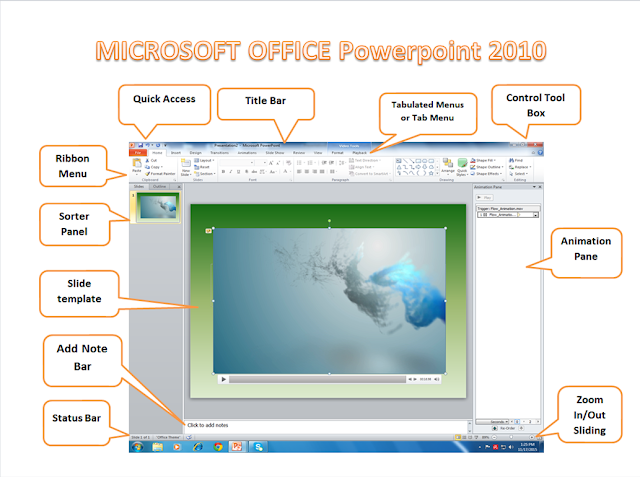 Microsoft PowerPoint 2010 is one of the enhance version of the Microsoft Office PowerPoint versions. This version has an improved feature compared to the 2007 version. Like the video and picture editing enhancements, such as the playback application of the motion backgrounds that you can insert in the slide template. Additionally, transitions and animations run smoother and richer than ever, compare to the latest versions. In the tab menus it have a ribbon menu and more enhance SmartArt graphics layout and some photo- base that you can add it up in your application. And the most of all you can easily collaborate with your colleagues on presentations. And several ways that you can broadcast and share your presentations more easily. Read the parts and function below in the order you learn the parts and functions of this Microsoft Office application on your computer. QUICK ACCESS- This button position top left portion, this toolbar is customizable, you can move this in two possible locations. This toolbar consists a set of commands that it is independent on the tab of the ribbon that currently displayed and you can add commands in this button. TITLE BAR- Position at the top of the user interface, where the file name will see here after saving a file, as a default once you open your MS-Office 2010 you will see it as Presentation 1-Microsoft PowerPoint. CONTROL TOOL BOX- Located right top of the user interface, where you can close, restore and maximize, and minimize the windows program. TAB MENU or a tab of the ribbon- Position below of the title bar, this relates to the type of activity, such as to relate a ribbon menu name, like once you click the home it will open as home ribbon menu. The tab menus are FILE,HOME, INSERT, DESIGN, TRANSITIONS, ANIMATIONS, SLIDE SHOW, REVIEW, and VIEW. RIBBON MENU- Position under of the tab menus, if you need to see it or control it, hold CTRL key and press F1. This menus contains all the commands and other menu items that you can help to find the command easily to finish your work. SLIDE SORTER- Position left side of your user interface, all the slides will arrange in vertical order from top as first slides down to your last slides. You can drag to rearrange the slides, delete, and other command once you right click your mouse. SLIDE TEMPLATE- This part is position at the center of your user interface, this is the biggest part where you can start and put your design in Presentation, animation, effects and more. ANIMATION PANE- It is a part and command of ANIMATION PANE, once you click this button, it will open in the right side portion of your user interface. This pane or panel will display the animation functions you use in your slide template. Also you can rearrange the animation and effects according to your own design. ZOOM IN and OUT SLIDING BAR- This part position right side down and above of the task bar. This is use to enlarge and decrease the view of your slide template at the center. ADD NOTE or NOTES PANE- This pane or panel position at the bottom of your user interface. Which you can type notes that you can accompany a slide. You can print these notes as notes pages or display it when you save a presentation as a web page. STATUS BAR- This part position below of the user interface and left side of the zoom in/out sliding bar and view buttons of slide show. This is only to notify what slide number you use in your application. That’s all see you in next post. If you want a more enhance application in PowerPoint, just install the PowerPoint 2013 version.